PALMDALE, Calif., Aug. 9, 2010 -- If you want to gauge Northrop Grumman Corporation's (NYSE:NOC) commitment to help the F-35 Joint Strike Fighter program make a successful transition to full rate production, just look at the calendar. As recently as two years ago, the company, a principal and founding member of the Lockheed Martin-led F-35 industry team, was delivering a center fuselage for this fifth generation, multi-role fighter to Lockheed Martin's final assembly facility in Fort Worth, Texas about once every 30 days. With this week's delivery of the center fuselage for the F-35 designated AF-14, however, that delivery interval has now dropped to just 10 days. And by early next year, the number is expected to drop to eight days. "We're moving steadily down the production learning curve, streamlining our processes and increasing our workforce as we continue to transition from delivering approximately two center fuselages per month to an eventual rate of delivering one center fuselage per day," said Mark Tucker, vice president and F-35 program manager for Northrop Grumman's Aerospace Systems sector. According to Mike Jones, director of F-35 production operations for Northrop Grumman Aerospace Systems, the steady drop in production interval – the time between center fuselage starts, or between center fuselage deliveries – can be attributed to the company's larger and increasingly skilled F-35 workforce, and to its more efficient utilization of center fuselage production tools. "For the past year, we've been on a pretty consistent 12-day production interval cycle," said Jones. "Over the last month or so, during the latter phases of assembling the center fuselage for BF-12, an F-35B STOVL aircraft, however, we've transitioned to a 10 day production interval cycle to support Lockheed Martin's updated final assembly schedule. The delivery of AF-14 is the first center fuselage to reflect that new, lower production interval." The shrinking delivery interval has also been aided by the fact that Northrop Grumman's F-35 touch-labor force has grown from about 65 employees two years ago to more than 250 employees today, added Jones. That work force is expected to reach 300 by the end of the year. Over the longer term, Northrop Grumman plans to reach the full production rate of completing approximately one center fuselage per day using a new integrated assembly line (IAL) currently being installed at its Palmdale Manufacturing Center. 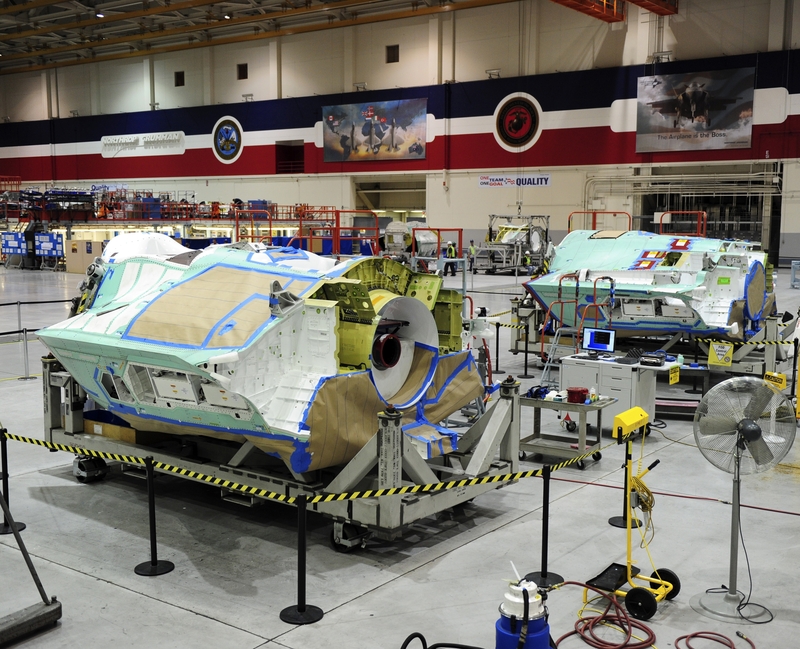 Expected to begin operations in early 2011, the IAL will feature automated guided vehicles that will simplify the process currently used to move center fuselage structures from one assembly station to the next. It is expected to help reduce F-35 program costs, and improve the precision and overall quality of the center fuselage production process. In addition to producing the F-35 center fuselage, Northrop Grumman also designed and produces the aircraft's radar and other key avionics including electro-optical and communications subsystems; develops mission systems and mission-planning software; leads the team's development of pilot and maintenance training system courseware; and manages the team's use, support and maintenance of low-observable technologies.